this week, Adam Powell revealed that his upcoming FEC report filing (July 15) will show that he has raised $100K towards his 2014 congressional bid for the Harlem/Bronx congressional seat now held by Rep. Charles Rangel. Powell, who endorsed Rangel in 2012, has had that congressional seat in his crosshairs before. 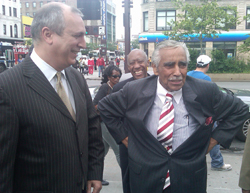 Adam believes that neither Rep. Rangel nor his favored and rumored successor ex-Gov. David Paterson will run in 2014. About Paterson, Powell believes, “[Paterson] won’t have the fire in the belly and [only wanted] to put himself back in the headlines” when he hinted that he might run to succeed Rangel. Apparently, Powell (who is of African American and Puerto Rican heritage) believes that he and whatever Dominican challenger arises would pose serious challenges to a Paterson candidacy. Powell expects to raise another $100K or more by end of the next fundraising quarter (October 30). Powell represented East Harlem and parts of Harlem in the City Council and the State Assembly. He left the State Assembly at the end of 2010 after unsuccessfully challenging Rep. Rangel. In 2012, Powell reversed himself and endorsed an embattled Rangel (also of African American/Puerto Rican heritage), then being vigorously challenged by State Senator Adriano Espaillat in a contentious congressional primary. This entry was posted in African Americans, Elections, Politics and tagged Adam Powell IV, charlie rangel, congress, david paterson, harlem. Bookmark the permalink.